Humble E-Liquid - Blue Dazzle 120mLWhen blue razz meets cotton candy you get "Blue Dazzle" enjoy!VG/..
Humble ICE Tropic Thunder 120mLStrawberry, kiwi candy on ICE that will leave your taste buds tinglin..
Humble ICE Ruby Red 120mLA tangy grapefruit and peach smoothie on ICE. Ingredients: Natural &am..
Humble ICE Pink Spark 120mLClassic pink lemonade with the tart of lemon, and the smooth chill of icy..
Humble ICE Oh-Ana 120mLExperience the flavors of Hawaii! A refreshing blend of ripe pinea..
Humble ICE Dragonfly 120mLWatermelon and honeydew with a hint of ICE will make your senses fly!.. Humble X Flawless - Suckerpunch 120mLA creamy and delightful mystery candy, Can you guess the flavor..
Humble X Flawless - Puckerface 120mLA delicious sour green apple candy. Sure to satisfy your sweet a..
Humble X Flawless - Creamy Custard 120mLA thickly frosted lemon cake custard. Hits the spot every ti..
Humble X Flawless - Blue Swirl 120mLA sweet sugary treat of blue raspberry-infused lemonade. A uniqu..
Humble E-Liquid - American Dream 120mLA fruity pebbles cereal treat. 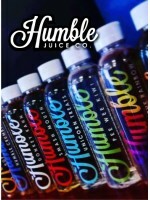 This vape juice flavor that wil..
Humble ICE Vape the Rainbow 120mLVape the Rainbow (VTR) knows how to stand out in a crowd! A colorfu..
Humble ICE Sweater Puppets 120mLMango, cantaloupe, and a little bit of honeydew melon on ICE. This f..
Humble ICE Pee Wee Kiwi 120mLAn elegant twist of kiwi with a couple slices of watermelon and apple w..
Humble ICE Donkey Kahn120mLA beautifully blend of strawberry banana with a nice splash of dragon fru..
Humble ICE Berry Blow Doe 120mLAn explosion of taste that awakens childhood memories. This flavor is..
Humble E-Liquid - Humble Crumble 120mLReminiscent of Grandma's homemade cobbler. This juice is a per..